A Taste Of The Sea! Aah the Salt Room. Somewhere I have been dreaming about going for months, and know all I can think about is when I can next go back. 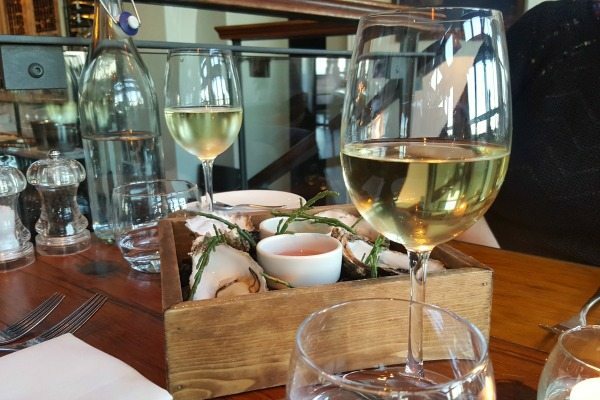 The Salt Room is a high quality seafood restaurant situated on Kings Road, just down from the new i360 tower and across from the seafront. 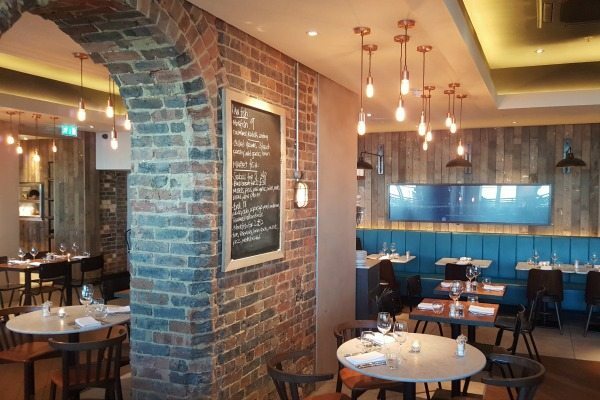 They are the sister company to the well established and reputable steak restaurant, Coal Shed, and ever since it has announced it’s opening back in 2014, they have been making waves across Brighton and the UK’s food scene. I invited a friend to join me who had been wanting to go for as long as I had, on a warm sunny May evening. After a quick post work beverage in the sun along the seafront, we skipped up to the Salt Room excited about what was ahead. I was going along to try their dishes which are suitable for someone who is gluten free, as a lot of their menu is adaptable or includes non gluten containing ingredients. When we walked in we were greeted and told we were actually half an hour early for our reservation, oops! The lady offered that our table was still available if we wanted to go straight through, or we could sit at the bar for a cocktail to start… The latter was chosen of course. 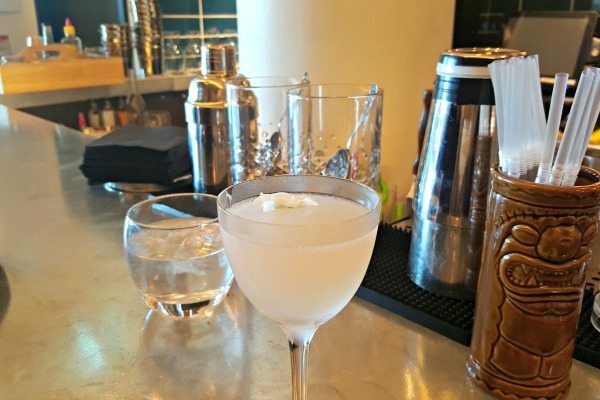 The cocktail list has been carefully created with earthy herbs and unique ingredients to show off finesse and skill, and here are some delectable sounding combinations to choose from. 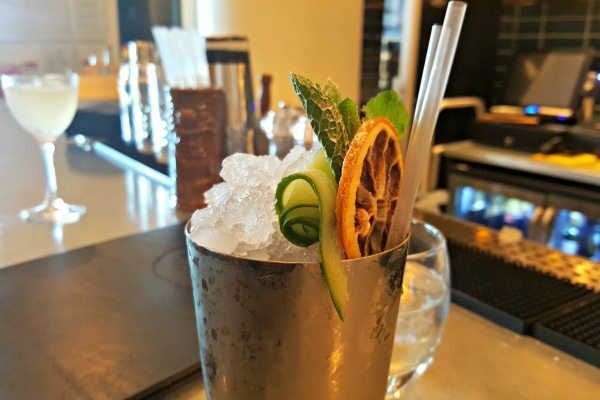 My friend and I were in the mood for gin that evening, and one of the specials on the blackboard near the bar was called the Sussex Summer Cup and included gin, citrus, cucumber juice, strawberry and balsamic shrub. It was light and refreshing and had so many layers of flavours I loved it! it was served in a silver cup with a dried blood orange and mint as the garnish. My friend chose the Gin Bouquet from the menu with beefeater gin, citrus, honey, orange blossom and rose essence which was sprayed over top to create a perfume aroma. It was incredibly pretty and dainty and tasted beautiful. 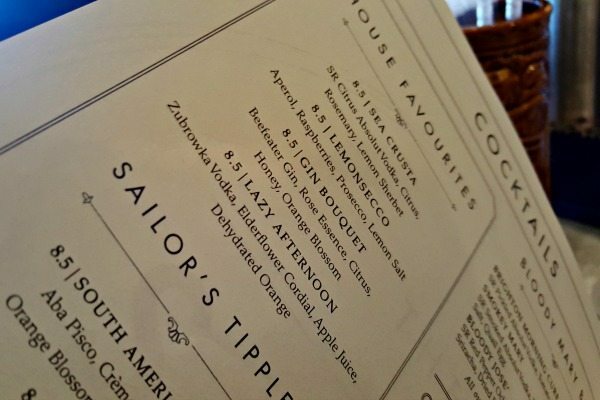 Both cocktails were perfect for a summers afternoon and were completely unique to anything I had tasted before. A little way into our drinks, we were asked if we were ready to head to our table, so our waitress popped our drinks on our tray and ushered us over. This was the first time I had been in the restaurant itself, and I loved the brand new furniture, everything was smart looking and tidily in place, but there was a welcoming industrial feel about it too. Our waitress explained the menu and specials to us, and they were listed on the blackboard behind us too. We were told that a lot of the menu can be adapted to be gluten free, however some menu items did have components that did contain gluten and wouldn’t really work without them. A couple of the main ones were pointed out to us, and she said anything else we want, she will be able to check with the chef first. The menu itself is full of incredible sounding dishes so decision making was tough. Throwing in the specials board too, my friend and I really had a hard time! 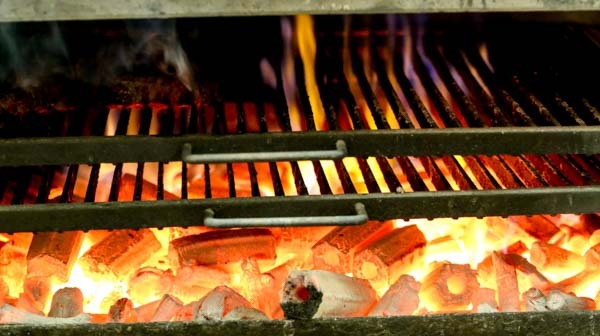 There are dishes to start to share for the table, raw dishes, chilled plates, mains, sides and dishes cooked on the Josper grill. 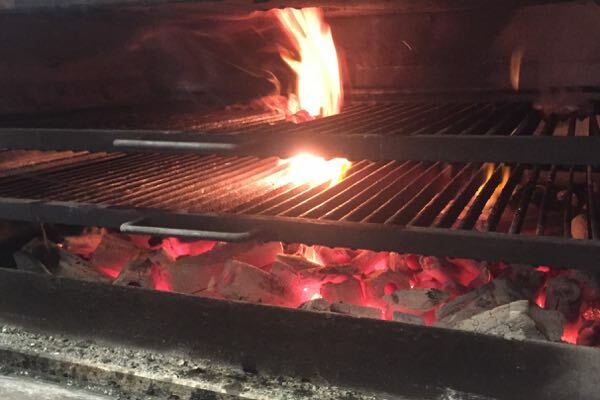 I had never tried anything cooked on a Josper before, I knew the Coal Shed and Salt Room were famous for it so we had to try something out from there. It is basically a super hot enclosed coal BBQ, perfect for cooking meat, whole fish or shellfish and I was eager to try it. To start we asked for some fresh oysters (£3.50 each or 4 for £13), and a raw dish from the specials board that was monk fish with cucumber radish and anchovy. We also went for one of the hot starters of cuttlefish, watermelon, mint, preserved lemon and radish. 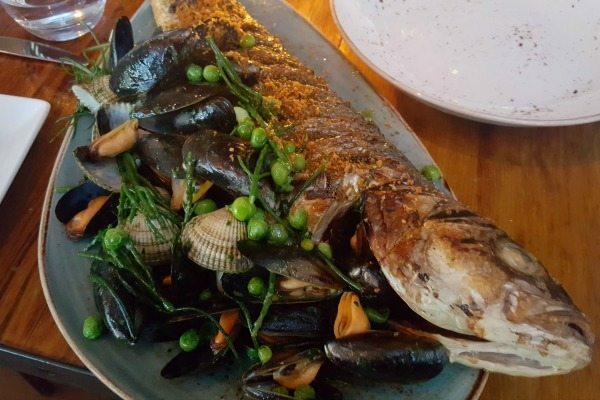 For our mains we decided to share the whole seabass cooked on the Josper that was on the specials board and served with fresh peas, mussels clams and samphire with baby potatoes as well. We were offered wine so I asked for our waitresses recommendation. Luckily she said they had been doing wine training that very day! She suggested a Portugese Vinho Verde, and a Riesling from Trimbach in France. Mine was the Riesling which tasted to me of candied apricots, and it was sharp to start with but lovely and soft on the finish. 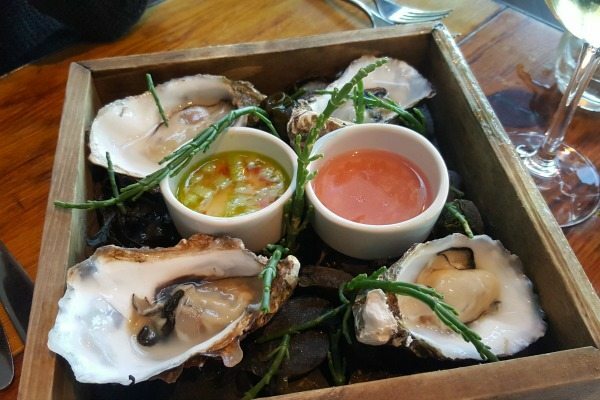 The oysters arrived first up and in a lovely presentation of frozen pebbles in a wooden box scattered with samphire. They were from Jersey and were plump and sweet, and tasted great with the Vietnamese dressing and shallot vinegar. The monkfish was lovely and minty and came with bright orange fish eggs and fresh cucumber. The fish was a lovely buttery texture and something I would love to have again. A perfect summery dish! We really enjoyed the cuttlefish that was cut into ribbons like rice noodles and cooked until soft, but not over done to chewy. 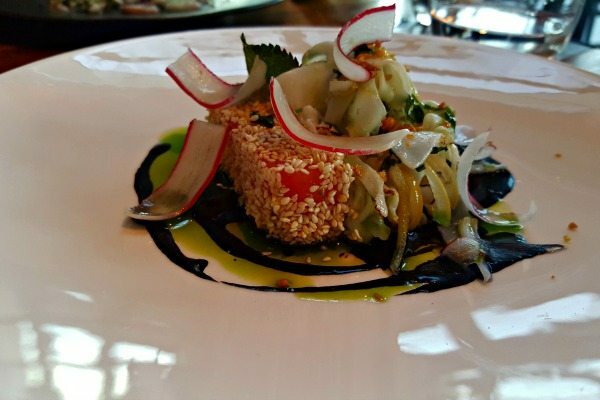 It came with a large baton of watermelon coated in sesame seeds and on a squid ink sauce, which combined provided a delicious balance of savoury, salty and refreshing. They were certainly flavour combinations I never could have thought of and with no gluten containing ingredients in sight! After our starters our plates were cleared and the wait staff started preparing the table for our main event. We were given a dish for the shells, towels, and serving spoons as well as a fish knife for filleting. Shortly after the fish arrived and it was enormous! For £48 it was a real steal, a whole seabass (probably the biggest I have ever seen) with mussels, clams and peas spilling out the side and a side dish of new potatoes as well. We were asked if we were okay to fillet and and we said we were, however we reaslised that neither of us knew how to do it so we called the staff back! She filleted it with ease, and left us with 4 large fillets of fish to dig into. I am seriously still dreaming about this now. The skin of the fish was charred from the Josper, making it crunchy and smoky. The fish was flaky and sweet, and there was seriously so much of it! But I couldn’t stop eating it is was so good. There were crunchy samphire threads, and an abundance of plump clams and mussels all perfectly rinsed. The potatoes were salty and fluffy inside, and the whole thing really was just a treat. I can’t recommend this enough as everything was cooked perfectly. 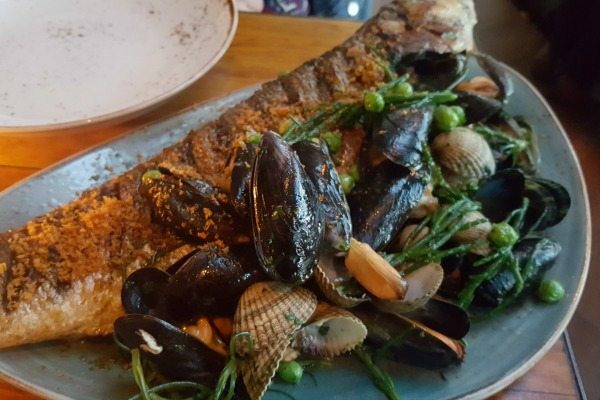 We noticed many other tables enjoyed the Surf board too which is also gluten free, and contains a range of different shellfish and seafood dishes of the day cooked over the Josper grill. It looked like great fun and I would like to go back with a few friends to get another whole fish to share and one of those. After our seabass defeat we were offered dessert, and I couldn’t say no even though I was positively stuffed. 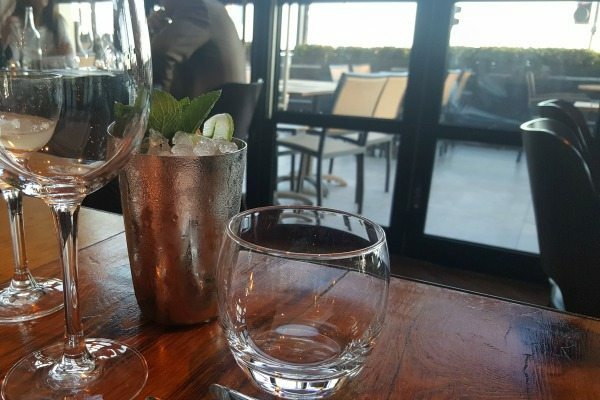 There are a few items on the menu that are gluten free, however if you have heard of the Salt Room bfore you have probably tried the Taste of the Pier and I knew I had to try it. It is a wooden plank actually rescued from the West Pier, and contains a selection of yummy desserts to remind you of the seaside treats you can enjoy along the promenade. I was told that most of the items are in fact gluten free, and the couple that aren’t they were able to adapt, hooray! To go with our dessert I ordered an espresso martini (obviously) and my friend ordered a cappuccino. The plank arrived and looked exciting. 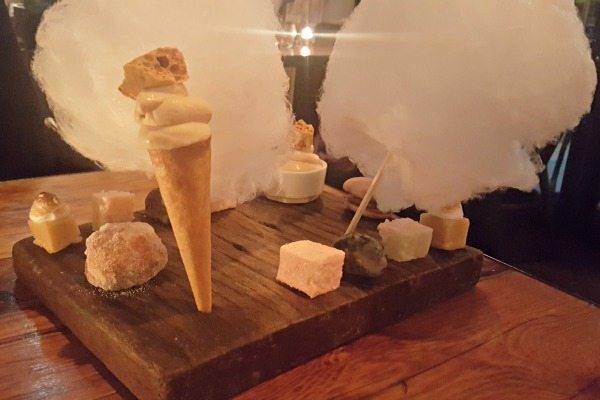 It contained, a rhubard marshmallow, chocolate truffle pebbles, icecream, coconut nougat, candyfloss and a lemon meringue fudge. The non gluten free options which my friend had included a doughnut with a custard filling, and a homemade ice cream cone. I just had the ice cream without the cone and it was lovely. I also was given a homemade macaron, that was crunchy and sweet instead of the doughnut. The candy floss was fun to eat and me and my friend ended up being children at the table by stuffing as much as we could in our mouth and letting it dissolve. The coconut nougat was nice and textured and the chocolate truffle pebble was rich and indulgent. The lemon meringue fudge was the star of the party for me, and some sort of revelation, it was delicious! I usually find fudge too sickly but the lemon cut through this really well. The dessert was totally worth it, and my friend both ended up with jittery sugar highs for the walk home. I would probably share that with a couple more of us next time, only because I am a sensitive wee soul! After a wonderful, indulgent and delicious evening, my friend and I left a thankful tip and headed home. 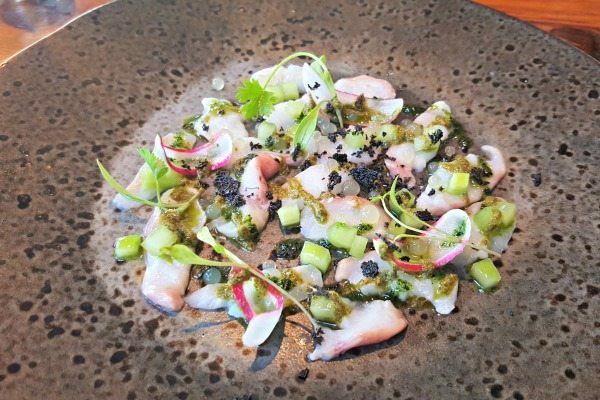 I was really impressed with the quality and freshness of the seafood at The Salt Room and I would urge you to go there soon. They offer enough gluten free dishes to give you plenty of choice, and for non seafood lovers and vegetarians there are options too. Thanks Salt Room for a delicious, fun and gluten free evening, one that I most certainly won’t be forgetting any time soon!